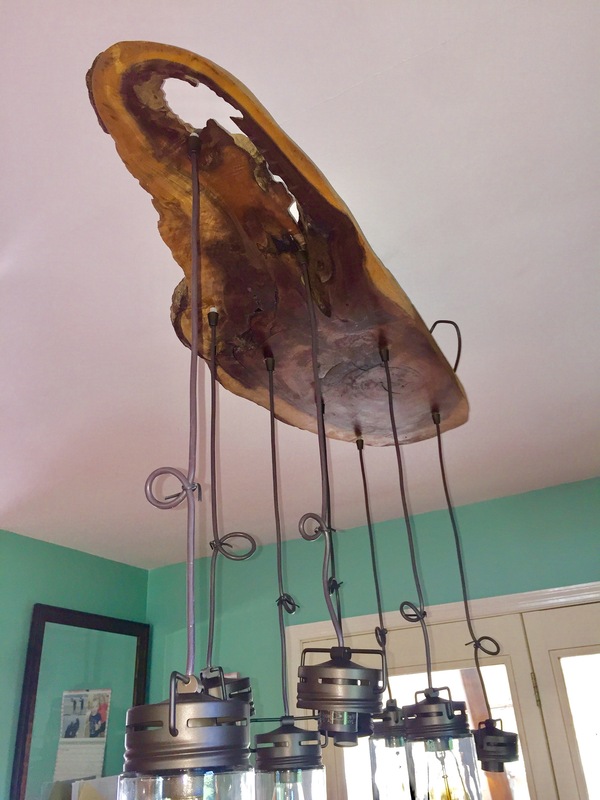 I have always wanted to make my own light fixture out of a wood slab, or “cookie”. Looking at the ten choices at a big box store that don’t come close to what I want only further drove home my desire. My pole barn is full of slabs and beautiful live edge pieces that I have collected over some time. These pieces are too beautiful to cut up into straight boards for furniture. I picked the perfect shape and size for my room and I got to work. The first step was to remove the existing 1970’s ceiling fan. It took a lot of work to get the slab ready and run all the wires for the 8 lights. My favorite part of any project is applying the polyurethane. This video shows how much the grain and colors pop when the polyurethane is applied. There is so much character and beauty in this cookie. Finally I got to install my new light fixture that I had made from start to finish. I love the holes and all the bark that is still on the cookie. This piece is walnut, my favorite species of wood. This is its natural color with just polyurethane to protect it and make it shine. 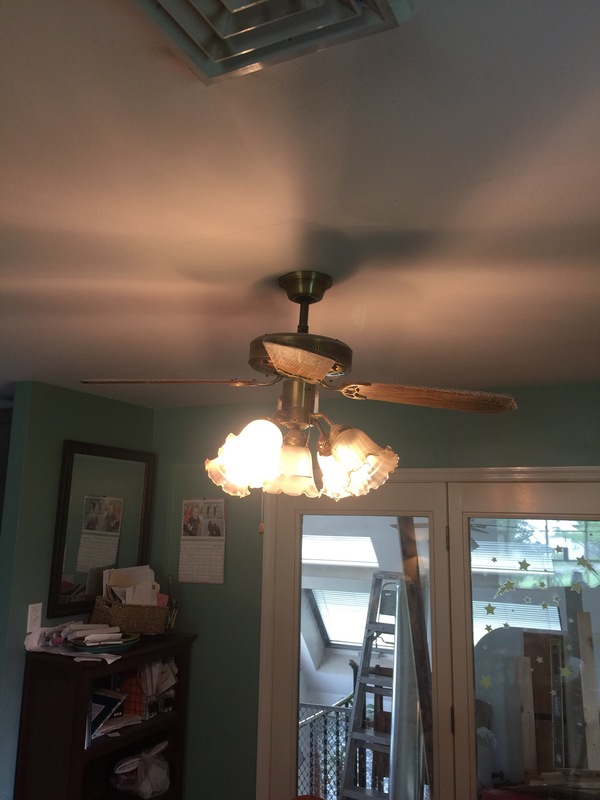 I installed the cookie fixture to a ceiling fan attachment. This gave the light a lower feel as well as allowing it to be turned if we move the table. 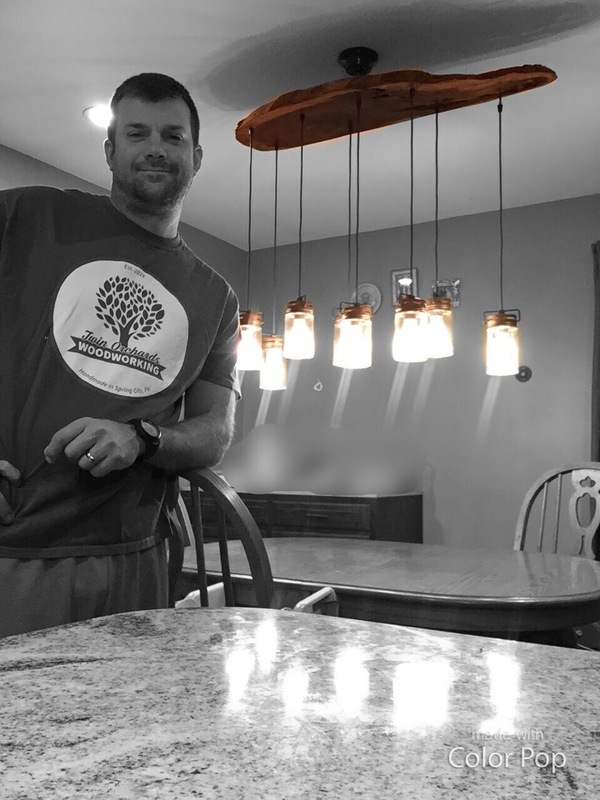 I really enjoyed this project and love the look with Edison bulbs. The rustic, natural flair of design is a great contrast to all the clean lines of the new kitchen cabinets and countertops. My father, Tim, is a first-generation American; both of his parents emmigrated from Ireland when they were teenagers. My grandfather, Frank, started his career as an apprentice carpenter in Ireland at age 14 and came to the US two years later. The Robinson family settled in the Philadelphia suburbs. When Frank and my grandmother, Mary Gerrighty, settled down on a 75 acre farm in the Malvern area they were sure to teach their 6 children about the value of hard work and quality of work. Years later, after his parent’s had divorced, my father traveled to Florida to live with Frank and quickly started his own career in carpentry at the ripe ‘old age’ of 13. My father started out building new homes and then went on do commercial construction buildings in center city Philadelphia; retiring after 32 years as a union carpenter. My parents well understood the risks and hardships that can come with a career in commercial construction and carpentry and they encouraged me to pursue a college degree. After completing 2 years at West Chester University (and making the National Team in Swimming) I realized that this wasn’t the path for me. I attended carpentry trade school for 4 years, while completing my apprenticeship, and graduated as a Journeyman in May of 2012. During this time I was able to work side-by-side with my father as he finished the last few years of his career and learned a great deal from him including my love of numbers and carpentry layout. During my 7 years in commercial construction I had married and became a father to twin boys. Until this time the risks of my profession had never weighed too heavy on my mind. However, after a fatality and near fatal accident at my job site I began to seriously reconsider a career in high rise construction. With the impending cost of child care x 2 and my desire to continue working in carpentry I decided to start my own woodworking company. Initially, it was difficult to change gears from a busy career in construction to full time dad and business owner. But as the boys have grown, along with my business, I’ve really enjoyed watching them learn new things and learn new woodworking skills myself. Taking on new projects, like farmhouse tables and live edge shelving, is a fun challenge and I look forward to furthering my business. My boys, Luke and Jake, in the shop. Earlier this year the Berry family requested a custom designed kitchen coffee cart for their home. They provided the dimensions to ensure that it would fit perfectly into their desired space. I designed a 3′ wide x 3′ high x 13″ deep structure out of poplar and red oak. The Berry’s wanted a painted and distressed base with a stained and poly’d top. I used poplar for the base as it is a lighter weight hardwood, accepts paint easily and lends itself well to being distressed. The top is constructed of solid red oak, which has nice grain that will pop when it is stained. There is plenty of storage with the ladder and solid shelves and 2 drawers. The shelves and legs are joined by mortise and tenon joinery; it is a simple and strong design that has been used by woodworkers for thousands of years. It was even used in the construction of Stonehenge. I framed the drawers with poplar strips to add dimension to the drawer fronts. Here you can see the aged brass drawer pulls chosen by designer Jessica Salomone. The solid red oak top was finished with an aged stain and sealed with poly. The base was painted black and finished with a distressing technique. The finished product fits perfectly in this space in the Berry’s home – one of the perks of designing a custom piece for your home! (photo by Jessica Salomone). This project utilized a variety of finishing techniques to create this beautiful ‘distressed’ and ‘aged’ kitchen/coffee cart and I look forward to creating other distressed pieces. Please let me know if this peaks your interest and you’d like a unique cart or table for your home. Weddings are a wonderful occasion to celebrate two people joining their lives together. A customer recently requested a wedding sign as a gift for a friend’s upcoming nuptials. Cape May, NJ has deep meaning for this couple; it is where the bride spent weekends at her grandmother’s beach house and it is also where the groom proposed on Valentine’s Day in 2016. For this reason I recreated the Cape May lighthouse and engraved the Saenz family name. They were married this past Saturday, June 11th at Hotel Alcott in Cape May, NJ. They were thrilled to receive this one of a kind piece to mark their wedding day and becoming a family together. This past fall my best friend, of over 20 years, was married at Bear Creek Lodge in Pennsylvania. Rob has been there for the many ups and downs in my life and I wanted to create something unique for him and his wife Katie. Rob and Katie love the outdoors, gardening, and going on adventures on their motorcycles. I wanted to create something that captured their relationship as well as their future together. I chose a raw edged piece of walnut for the Tavares’ sign – a nice strong hardwood. After engraving their family name and year of marriage I began to sketch out a scene. One that represented their family and friends, their future together and that their love may continue to grow and strengthen through the years. This was truly a labor of love and it now hangs in the home they share together. In addition to the sign I also use my scroll saw to carve out a cake topper for Rob and Katie’s wedding. After carving out the design I used a small flame to highlight the hearts and woodburned their initials into the topper. Please let me know if you are interested in a wedding sign for yourself or as a beautiful, thoughtful gift to a loved one! Last week I showed the Rustic Farmhouse table that I created for the O’Kelley’s home. In addition to the table I also fabricated a wall mount TV unit with picture frames on the doors as well as a set of three walnut shelves. They have a sleek design that highlights the intricate grain and natural dark stain of the wood. I planed down the walnut and squared the edges in preparation. Above you can see the lighter ‘sapling’ wood; demonstrating the interesting color variations that can be seen in walnut. The shelves are approximately 2′ wide x 6″ high x 6″ deep. Biscuit joints were used to craft a sturdy product. These shelves will be hanging in triplicate to hold towels and toiletries. The shelves were sanded to a glass-like smoothness. No stain needed here, a few coats of poly lets its natural beauty shine through. Please email me with any projects you’d like customized for your home! Hello again! It’s been awhile since my last project post, so let me introduce myself. My name is Tim and I am trained carpenter with over 10 years experience. I started Twin Orchards when my twin boys were a few months old and have enjoyed being home with them while crafting original wood designs. I worked with the Jessica Salomone Design to create this beautiful Rustic Red Oak farmhouse table for the O’Kelley’s. I also crafted a custom TV Unit and solid walnut wood shelves for their gorgeous home in Virginia. Before the start of every project I visit my local sawmill to select the perfect wood for the piece. The O’Kelley family wanted a rustic farmhouse table that could fit both their immediate and extended family. With this in mind I designed a ‘breadboard’ farmhouse table with wood leaves allowing for a 10′ long x 3.5′ wide. I chose a Rustic Red Oak which has beautiful mineral veins in it and really highlights the grain of the wood. After constructing the table top I created detailed edging between the boards as well as some distressing to capture the rustic look. Here is an in-process photo of the trestle base that the O’Kelley’s chose for their table. Dark ebony stain enhances the grain patterns and mineral variations in the wood. Rustic red oak also has interesting ‘imperfections’ like the worm hole shown in the bread board above. Ebony stain with a gray-wash glaze give the table a beautiful distressed, well-worn and well loved look. Table before the final touches and finishing. And here is the final product in the O’Kelley’s beautiful home. Shown here is the 7′ table; hidden leaves allow it to extend up to 10′ with comfortable seating for 8! I love how well the dark stain of the table pops against the clean white walls and blue tones of the room. Creating this table was one of my favorite and largest projects to date! As always please send me an email at TwinOrchardsWoodworking@gmail.com if you have an idea about a custom woodworking project – I’d love to design a custom piece for your home! Oftentimes when people see the word ‘Custom’ to describe a handmade table or other wood projects means that it must be ‘extra expensive’. Although this may be true some of the time, most custom-built furniture is actually cheaper than those from a popular online store! One of my biggest peeves is when sellers or retailers over use trendy words like Rustic/Wedding/Reclaimed to increase the cost of a product. Not only will you most likely be paying more, but you will be getting LESS! Almost all commercial manufacturers use sub-par quality materials to get a larger profit (hint, hint it’s pine haha). They mass produce so thousands of other people will have the exact same piece of furniture. (like the ‘apothecary table’ in Friends). Perhaps the most important point of all is just the quality. Although some custom-built pieces may cost double up front, you will NEVER have to buy a new one because of it breaking. These are quality pieces that are truly meant to last. They will become a part of your home that you will one day be able to give to a family member for them to cherish. Skilled woodworking is quickly becoming a lost trade, especially with the loss of wood shop classes in America’s schools. Custom-built furniture is individually crafted by hand to my customer’s specifications. You’re not only getting quality, you’re getting years of practice, sweat, and passion. When you buy custom you support a Family, not a corporation. So if you’ve had your eye on a beautiful piece of furniture, but it was a little too small or big or not enough shelving, then please send me a few pictures and specifications and I can create something perfect for you. I’m sure you’ll be happily surprised with what we can design together!